Using Mathematics many different types of puzzle can be created. In some of these Maths Brain Teasers one has to find the missing number. In some of the Math Puzzles one has to find the next number in the series. In some of the Maths Picture Puzzles one has to solve the Mathematical equations where variables are represented by different symbols. Today's Maths IQ Questions are based on Mathematical equations. In each of these Maths Brain Teasers, some Mathematical equations are given. Using these equations you have to find the value of different variables in these equations and then solve the last equation. 1. Can you solve this New Year Maths equation? 2. Can you solve this Maths Equations? 3. Can you solve this Maths Picture Puzzle? 4. Can you solve this shapes Maths Puzzle? 5. Can you solve this Maths Picture Equation? You need good Mathematical knowledge to solve these Maths Picture Equation Puzzles. Do checkout below Mentioned Maths and Logic Puzzles to shake your brain. Cool Maths Brain Teasers with Answers and Explanations : Lets start with easy Missing number Maths Cool brain teasers in which your challenge is find the missing number which will replace the question mark. It contains 5 different types of Maths brain teasers to challenge your brain. Math Brain Teasers with Answers : This is Maths Brain Teasers to find the logical pattern among given numbers and then solve it for the missing number. Tough Math Puzzles Brain Teasers to Tickle your Mind : Now its time to solve some tough Maths Brain Teasers to twist your mind. Can you find the missing numbers in these puzzles? 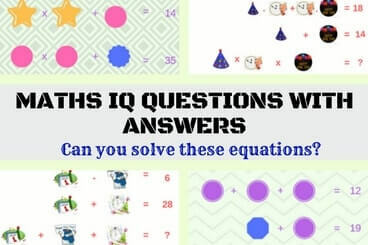 Tricky Maths Mind Game Brain Teasers with Answers and Explanations : If are are able to solve above mentioned Maths Brain Teasers effortlessly, then these tricky Maths brain teasers are going to be challenging for you. Do check it out. substituting value of S in (1). Substituting value from (2) in (1).